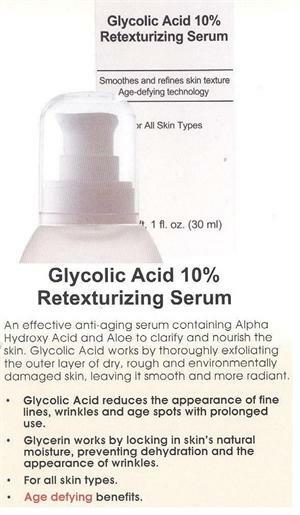 Home > Skin Care > Shop by Skin Type > Normal or Sensitive > GLYCOLIC ACID 10% RETEXTURIZING SERUM w/Alpha Hydroxy Acid & Aloe - 1oz.- Anti-aging, clarifies & nourishes - LB - TOP SELLER! An effective anti-aging serum containing Alpha Hydroxy Acid and Aloe to clarify and nourish the skin. Glycolic Acid works by thoroughly exfoliating the outer layer of dry, rough and environmentally damaged skin, leaving it smooth and more radiant. Glycolic Acid reduces the appearance of fine lines, wrinkles and age spots with prolonged use.